The so-called ‘Amityville Horror’ has become something of an American franchise. It all started back in the mid-1970s when the Lutz family bought a large seaside home which had previously been the home of a family brutally murdered in their beds. As a result, through local reputation, the house was going cheap and the family decided to give it a punt. The jury is out on what actually happened next, but they reported a series of unexplainable supernatural occurrences which were both malevolent and increasingly violent which eventually caused them to abandon the house after just 28 days and move to the other side of the country – appearing in newspapers and TV stations along the way to share their horrific tale. 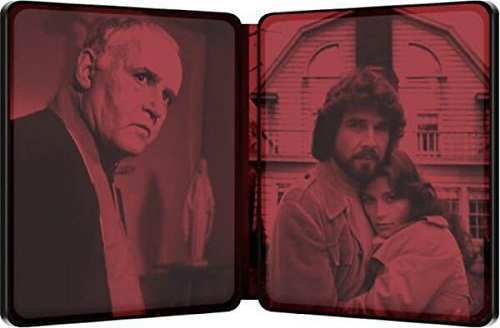 The story was soon wrapped into a best-selling book which, in turn became the (original) film, ‘The Amityville Horror’, released in 1979, at the height of the seventies supernatural boom which had started with Rosemary’s Baby (1968), The Excorcist (1974) and The Omen (1976) . I recall the hype at the local cinema, with one of the best tag posters in movie history (‘For God’s sake, Get Out!’). At the time, all supernatural thrillers seemed to be deeply wrapped up with religion (usually Christianity) and this was no exception. I recall enjoying the film immensely which was full of twists and turns, shocks and violence – though, on re-watching it today, much of this impact has been lost through the mists of time and the prevalence of the highly violent slasher films which followed in its wake. 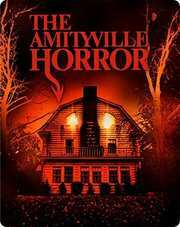 ‘The Amityville Horror’ has become one of those films that horror fans hold dear as it really kicked off an industry of sequels, none of which lived up to the initial impact of the original. That said, it’s a film that looks very much of its time, replete with 70s fashion and style. Despite this, I’m sure fans will lap up the limited-edition steel-book edition in HD for the first time in the UK. What’s even more fun about this edition is that you not only get the film, the mass of extra features really pulls together the ‘real story’ as well as a pretty fair analysis of how ‘true’ the story was likely to be. I’ll get to those later, suffice to say the features are pretty much worth the price of entry alone. Here are the ‘facts’ in summary (you can Google this stuff and watch countless YouTube videos featuring the Lutz family too if you’re in a mood for it). Ronald De Feo, the oldest son of the family resident at 112 Ocean Avenue, Amityville, New York, shot and killed his parents and siblings whilst they were sleeping, later claiming that voices in the house had made him do it. The Lutz family moved in shortly afterwards. Then weird stuff started to happen, like doors swinging open; windows slamming shut on fingers; flies inexplicably congregating in their thousands; empty chairs moving and so on. The local priest, on a visit to the home, was so overwhelmed by an evil presence that he couldn’t bear to be near it. And so on. As a result, the Lutz family fled and left the house keys back at the estate agents. There are many theories from ‘it’s all true’ through to ‘it was all imagined’ (the family had form in seeking out the esoteric) to ‘they were in financial ruin and needed the money’. But what was perhaps most spooky was the compelling and consistent accounts by the children, somewhat harder to dismiss. Which is maybe why the story caught the media’s attention and became such a big deal. Once vacated, the house was exorcised a number of times as well as various other paranormal treatments, though no one was ever able to vouch for any ‘presence’ in the house. Indeed, none of the families that have lived there since have reported anything unusual at all, suggesting that, if there was a spirit, it left around the same time as the Lutz family. The film is a well-made, pretty accurate reflection of the book, which in turn was a supposedly accurate reflection of the Lutz’s account. Its executive Producer was one Samuel Z Arkoff (not always a sign of high quality) and the film is ably directed by Stuart Rosenberg, perhaps best known for his work with Paul Newman in films like Cool Hand Luke. Adding to the ‘quality’ team associated with the film was a score from Lalo Schifrin which, as always, is top notch. (Watch the feature on how his choice of notes gives the films a strange, off-kilter feeling from the outset). The film opens, predictably, with the gruesome De Feo murders but quickly moves on to show a young couple looking around the house – presumably newly-weds though it becomes apparent that they already have a family, three young kids in all, partially from previous relationships. They’re aware of the circumstances of the sales but with some $20,000 off the normal asking price, they’re prepared to overlook its recent history and give it a go. Which is when the fun starts. Initially it’s just small stuff – doors blowing open, flies congregating where they shouldn’t, weird vibes and so on. 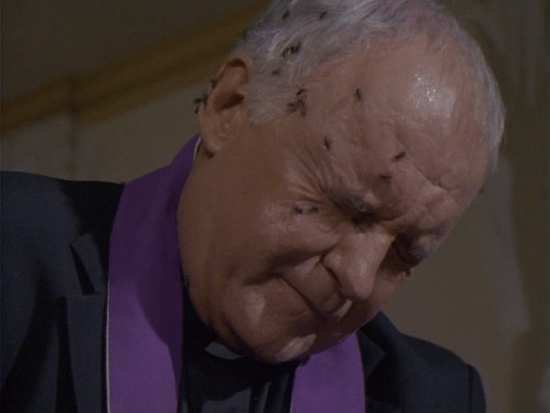 When a local priest (played by Rod Steiger) comes around to bless the house he is overwhelmed by an evil presence and completely covered by flies. He hears voices telling him to leave the house – which he does, though with grim determination to return and help rid whatever evil is there. In the meantime, George Lutz is acting weirder everyday – as if possessed by some deep melancholy. He is also consistently waking up at precisely 3am, the time of the murders, with a feeling that there is a presence in the house and grounds. Then the story gets weirder. Kathy Lutz, the mum, reads up about the house’s history at the local library and discovers that it was built on an ancient Indian burial ground. She is now convinced that the family is in danger from a supernatural force and when one of the kids gets his hand flattened completely by a window that refuses to budge (which becomes unflattened moments later) she decides the family must make a run for it – with the hope that the spirits don’t follow. Tragically, in ‘real-life’, one of the children, now an adult in his late forties, believes that the spirit entered into him and he carried it for many years after the event. You can hear all about it in the extensive 90 minute documentary also included in the set which, for me, utterly convinced me that the whole thing was a hoax – though with tragic consequences for that particular child who was swallowing his parent’s version of events wholesale. But you watch and make up your own mind. By today’s standards, the film probably isn’t as fast-moving as many viewers would like, and the shocks don’t come particularly thick and fast. Some of the effects – like bleeding walls – were well executed for the time but this was pre-CGI and looks it. But it is nonetheless, entertaining enough as a period piece. James Brolin is particularly good as the brooding father, getting progressively moody as the film progresses. The extra features here are plentiful and well worth a look. Included is the ‘For God’s Sake, Get Out!’ making-of documentary which has appeared on previous DVD releases which is pretty much interview based with both James Brolin and Margot Kidder (who played the mum). 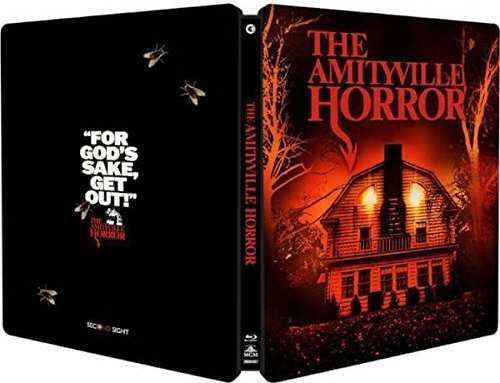 An unusual addition is an audio commentary by parapsychologist and author of an Amityville book (which Amityville II was based on) Hanz Holzer who also provides an interesting introduction to the film. Fans of the film will be pleased to note that it also comes with brand new interviews with James Brolin, the incredibly positive and upbeat Meeno Peluce (who plays Daniel Lutz, one of the kids) ,screenwriter Sandor Stern and composer Lalo Schifrin. The real crown jewel of the set though is the inclusion of ‘My Amityville Horror’, a 2012 90-minute documentary that features Daniel Lutz, the eldest of the three children. He’s either a brilliant fraudster to this day, a great actor or a seriously disturbed individual. Whatever the case, there is an air of melancholy and turmoil about him that has to have come from somewhere – possibly the breaking up of his first parents at an early age and a distrust of his step-dad, Bob Klutz. His own interpretation is that it all happened, but mainly because of Bob Klutz’s experimentation with esoteric dark forces. When an old family friend of his mother’s brings out a cross which she claims to be made of the actual cross upon which Jesus died, and he cries, gently fondling it, it struck me that here was a very sensitive and gullible individual. But that was just my own view. Whatever the case, compelling viewing and a fairly balanced approach will let you make up your mind. So all in all, a really great package from Second Sight. ‘The Amityville Horror’ may not be the best horror film ever made, but it’s still a fun watch and has a very interesting background too – which is much explored in the extra features here. Recommended. I absolutely adore this movie. Ryan Reynolds hsa created an amazing role here. Definitely worth watching!